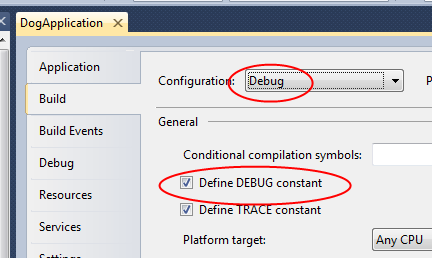 By default, Visual Studio creates a Debug build configuration in which the Define DEBUG constant option is checked. You can check to see if this constant (or “conditional compilation symbol”) is defined in your code, using the #if directive. Code between the #if DEBUG and matching #endif will be compiled only if the DEBUG compilation symbol has been defined. By default, this will be true for the Debug build configuration, but not the Release build configuration.